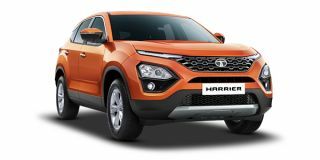 Tata Harrier price in Delhi starts from Rs. 12.69 lakh (Ex-showroom). Harrier is available in only 4 variant. Tata Harrier's top competitors are Hyundai Creta (price starting at Rs. 9.60 lakh in Delhi) and Jeep Compass (price starting at Rs. 15.60 lakh in Delhi). Q. Why should I by SUV in the price range of 15-20 lakh? Q. How much will it cost for changing the 17inch alloys to 19 inch alloy for the full option XZ including the on road price? Q. What is the regular paid service cost of Harrier diesel new model and service intervals? Q. Which variant is value for money? Q. What is service cost for Harrier? How much is the cabin noise in Harrier compared to Jeep Compass?